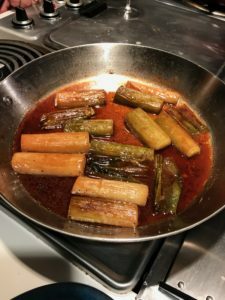 We love projects around here, and since July 2016, we’ve been attempting to cook everything out of Paula Wolfert’s The Cooking of Southwest France. Inexplicably (oh, who am I kidding? We’re slackers) we have never blogged about this, but have put photos in an album on Facebook. It’s lazy, but we do have the enormous honor of having the amazing Paula Wolfert be a follower of this album. Every time she comments or ‘likes’, we squee. As with our other cookbook project, we’ve made everything harder on ourselves by being on Weight Watchers. WW is not exactly friendly to foie gras, cream, sweet, life-giving butter, confit and duck fat, which are, of course, essential ingredients in southern French cooking. BUT we are determined to finish this book, largely because there has not been one single recipe that hasn’t been utterly wonderful. This new one is no different. So, recipe number forty-six, Chaudrée au Pineau. It’s super simple, as are many of the best recipes in this book. It’s braised leeks, which are a bed for filets of fish, mussels and scallops. But the devil is in the details. To the braised leeks, you add white wine and Pineau de Charentes. Pineau is an amazing aperitif that’s made from Cognac and sweet unfermented grape juice. It tastes like…(runs downstairs to have some) maybe a young sweet white port? It’s hard to describe but worth tracking down. 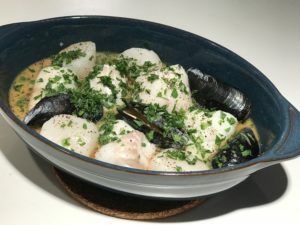 The braised leeks go into a casserole, then the filets of fish (we used gray sole and haddock) get rolled up and placed on top, then stuck in the oven, then mussels and large scallops are added and put back in the oven. Once this comes out, it’s finished with an utterly decadent sauce of crème fraîche and brined green peppercorns (thanks, Amazon), and parsley, tarragon and chives. Holy cow, this was good. The fish was perfectly cooked and lightly perfumed with all the fragrant herbs, and the leeks – OMG, the leeks. They were rich, buttery, silky, leek-y, and a genius-level contrast with the simple fish. The one thing that went a little amiss (and it’s not us if something doesn’t go amiss) was that the enormous mussels Nathan bought weren’t quite done. Next time we’ll buy smaller mussels or put the big ones in earlier. The cooking time in the recipe was spot on for everything else and it would have been a crime to let it cook longer. But still. Wow. Sadly, we did not have bread to sop up the juice, but never fear, we did not hesitate to drink it straight from the bowl. This was totally worth using more than half of our allotted daily WW points. We’d do it again in a heartbeat.